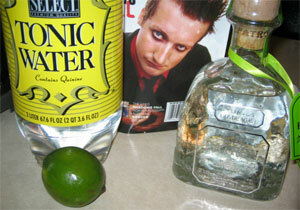 Cheech, the amazing alcoholic beverage named and loved by Tre Cool, is enjoyed by drinkers worldwide. Consisting of silver tequila, tonic and a little wedge of lemon to top it off, was named by Tre Cool himself but was not created by him. It’s been handed down from Timothy Leary to Cheech Marin and remained unnamed for sometime until Tre was introduced to it. Now the question forms: just how much of the stuff does Mr. Cool drink? To some it may seem like Cheech to Tre is what coffee is to a snobby caffeine-addicted business person. Of course, no one but Tre and those closest around him could say for sure how much of the substance he consumes, but with the help of other Tre fans we’ll check out how many times we’ve seen him drinking it. Take notice again that Cheech is an alcoholic drink meant for those over the drinking age or those under that don’t get caught. For those of you who want to know how to make it, I’ve gone through the trouble to be kind to you all and provide the simple instructions for making the damn good beverage. Make sure you have a lemon, tonic water and tequila. Now get a glass, you know that thing you drink out of? Still with me here? Good, now add a shot of tequila, not too much unless you feel like passing out. Alright, following the tequila in the line up is the tonic water, two shots I’m told is about right. Lastly, a couple squeezes from lemon wedges and there you go. Feel proud, you just made a legendary Cheech, congratulations and enjoy it. So there you go, you are now hopefully a little bit wiser about Cheech.